After tasting wines in the hotel with the producers for two days, it was nice to get out and visit the wineries and walk among the vines. 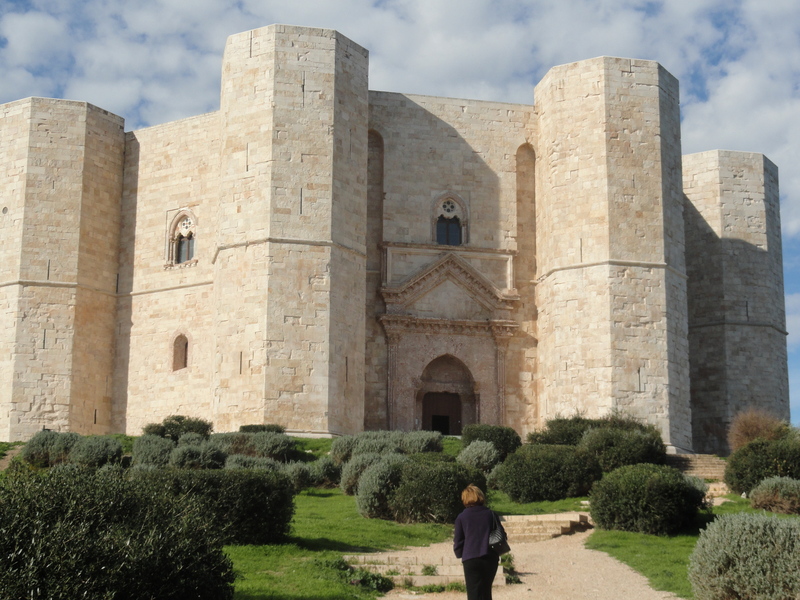 We also visited a cheese producer, the octagonal castle commissioned by the Emperor Frederick II of Swabia, and the region around the castle known as Castel del Monte. We were guided in our walking tour of the vineyards by Robert Perrone Capano, one of the owners. 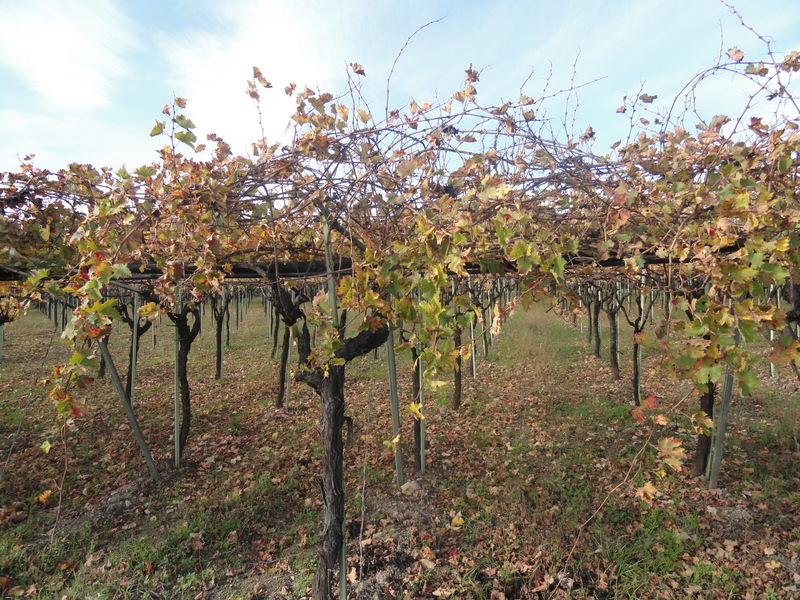 He pointed out the different training systems for the vines, the Guyot and the more traditional Tendone system (Pergola). They do not buy grapes, do not use any chemical products in the fields, and are 100% biological. Grass was growing between the rows of vines and Robert told us that this was done so that they would have natural mulch after the grass was cut and that the competition with the grass for “food” and water was good for the vines. They use French oak barriques (Allier and Troncais). Fined grained 228L barrels but he said it is a very “controlled” use as well as 35hl barrels. For their top wines there is no stabilization or filtration. All this they feel gives them their individuality and a respect for the terroir. We then had a tasting of Riserva “Le More” Castel Del Monte DOC 2007, 2006, 2004, 2003, 2001, 2000, 1999, 1998 and1996. I have tasted older vintages of Negroamaro and Primitivo but most of the Nero di Troia I tasted were from recent vintages. I have had older Nero di Troia, but those wines from the Castel Del Monte always had a fair percentage of Montepulciano. I was looking forward to this tasting so many different vintages of Uva di Troia (also know as Nero di Troia) at one tasting. Uva di Troia grows best in the Castel del Monte zone, an area that extends north from Bari to the province of Foggia. This area was once dominated by Frederick ll of Swabia (Hohenstaufen, d.1250). He was called “the wonder of the world” by some and “the antichrist” by the pope, and he left his imprint on this part of Puglia. Uva di Troia might have originated in Asia Minor and was probably brought here by the Greeks. It is named for the town Troia (Troy) in the province of Foggia. The grape does very well in Puglia’s hot climate and does well in most soils. The clusters are compact, V-shaped and sometimes winged and the grapes are violet in color. Uva di Troia ripens in the middle of October later than most other grapes in this region. 2007 is 100% Uva di Troia. There are 4,000/5000 plants/ha trained in single and double Guyot. The grapes are harvested in mid to late October, they are softly pressed and maceration takes place in rotating stainless steel tanks. It is aged for 12/18 months in French barriques of 228L and in bottle for twelve months before release. This is a more modern style wine. This is the current vintage. 1996 was a very interesting wine. The vineyard was 50 years old and it was owned by the owner’s aunt who died at the age of 97. It was aged in 35hl barrels. The wine was still very much alive with very good color. It still had fruit and was drinking very well. I drank all of it with the light lunch that we were served. 1998 was very much like the 1996 but not as mellow. 1999 was very also drinking very well with nice mature fruit and a hint of chocolate. I drank all of this wine. 2000 was not drinking as well as the older wines but was still holding up. and I felt the wine had changed. 2004 was a good vintage–this was drinking well and was the best of the modern style wines. They are also doing a top of the line wine called Riserva 0,618 Castle del Monte DOC. 100% Uva di Troia . Only 500 bottles will be produced. After being aged for 18 months in 225 liter oak barrels the wine matures underground for 6-1/2 years. It will be released it 2012. 0,168 a numerical sequence called “Golden Means” in medieval times and was developed by Fibonacci, a mathematician from Pisa in the Xll century. The famous octagonal Castel del Monte designed with this formula and commissioned by Frederic ll, is only 20Kl from the vineyards and can be seen on clear days. Next we visited Villa Schinosa, a winery that I had visited a few years ago. I had been impressed by their wines. When I walked into the wine cellar I was happy to see that everything was the same. Two long rows of barrels of Slovenian oak 35HL and not a barrique in sight. Another winery we visited had a large room filled with many new barriques. After a few minutes I had to leave because the smell was making me ill. At Villa Schinosa all the wines are aged in stainless steel or in botte grande. I like their 100% Uva di Troia 2007 DOC. The wine is aged for two years in large barrels of Slavonian oak 35HL and for 3/6 months in bottle before release. It is a very elegant wine with black fruit aromas and flavors and hints of violet with a very pleasant finish and aftertaste. It is a very good food wine. 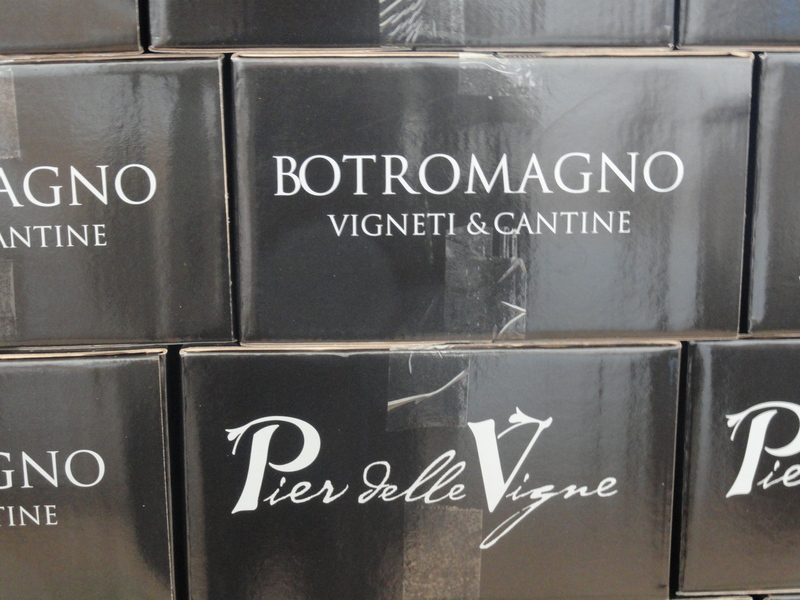 The Botromagno winery is located just outside the town of Gravina. In 1991 the D’Agostino family, which was a member of the local cooperative took it over. It was the first time in Italy where a privately owned compan partnered with more than 100 local growers. We were given a tour of the winery by the very personable and knowledgeable Beniamino D’Agostino. I had met Beniamino before when I was working for an Apulian restaurant in NYC where we sold his wines, and at Vintaly in Verona. Gravina DOC 2009 made from 60% Greco di Tufo and 40% Malvasia. Beniamino said that sometime there is the addition of a little Fiano and Bianco di Alessano. Fermentation is in stainless steel tanks for 15 days, there is no malolatic. The wine is fruity and fresh almost like biting into a green apply with a slight touch of pineapple and good acidity. They are the only producers of Gravina. Pier della Vigno Rosso Murgia IGT 2006 Made from 60% Aglianico and 40% Montepulciano The vines of Aglianico are planted in deep volcanic soil and the ones for Montepulciano in chalky soil. The training system is also different, bush for Aglianico and vertical for Montepulciano. The harvest takes place in late October. The wine is fermented in stainless steel with 20 days skin contact. 50% of the wine is in new Allier barriques and 50% in barriques of second passage. The wine has aromas and flavors of red berries, pepper, and hints of tobacco and chocolate. 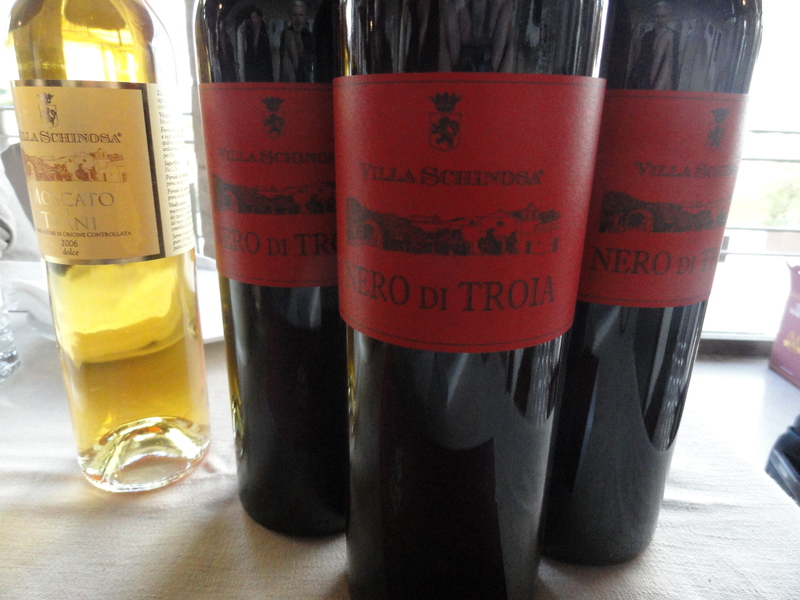 The wine is named for Pier della Vigno the right hand man of Frederic II of Swabia. Pier was said to introduce the first red grapes to this zone. I also liked their Nero di Troia Rosso Murgia IGT 2007. Fermentation takes place in stainless steel tanks with skin contact for 10 days. The wine is then aged in stainless steel for 20 months. The wine does not undergo malolatic fermentation. It remains in the bottle for six months before release. This is a very interesting wine with aromas and flavors of cherries, tobacco and a touch of spice. On the afternoon of the last day there was a vertical tasting of Taurasi (Aglicanico), Contrade di Taurasi Cantina Leonardo and Patriglione (90% Negroamaro and 10% Malvasia Nera) Cosimo Taurino Vintages 99-00-01 the panel was hosted by Franco Ziliani and Luciano Pignataro. 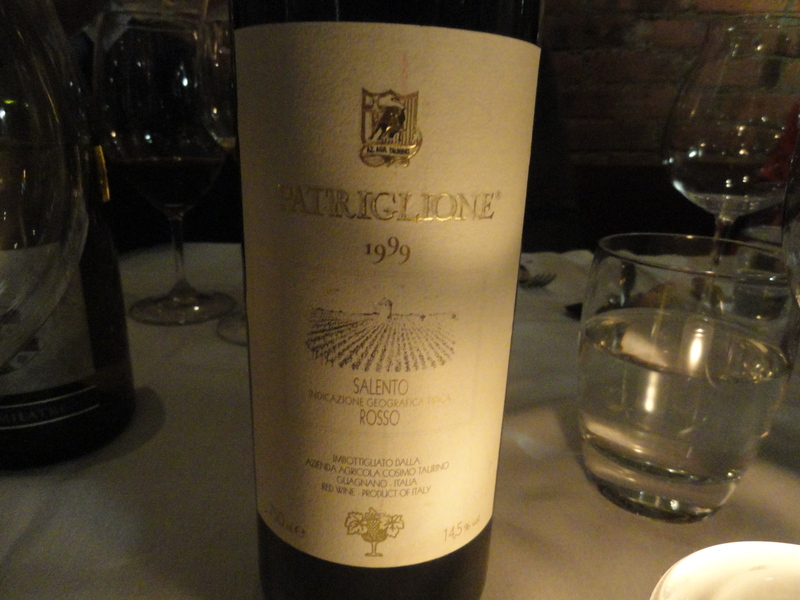 I have a long history with Patriglione going back to the first vintage in 1979. It had been called the Amarone of the south–a description I never liked. I visited the winery a few years ago and tasted the ‘99. I also tasted it a number of times in NYC. I found the wine not to be as big and jammy as some of the older vintages. It is still a powerful wine but more elegant and the dried fruit was not as pronounced. However there is still the classic Negroamaro aroma with an undertone of prune. The 2000 and 2001 had the same characteristic. When I asked Francesco Taurino if he did anything different since 1999, his answer was “only in the vineyard”. My favorite at the tasting was the 2001. At a League of Gentle Men dinner I brought the 1999 Patrigione and I decanted it before dinner. The wine opened in the glass and was really drinking well. Cantina Leonardo Contrade di Taurasi 100% Aglianico this winery is only four hectares of vineyards and produces only four wines. The vineyards are at 350/400 meters and the vines are 20/50 years old. The harvest takes place the first week of November. Maceration in stainless steel for one month, aged in barrels for 18 months and in bottle for 12 months before it is released. The wine has aromas and flavors of cherry, plum, violets and hints of spice. The 2001 was showing the best. Dolce Guide – Percorsi enogastronomici di Puglia e dintorni a guide to the restaurants, wine bars and places to stay in Apulia (Eighth Edition). 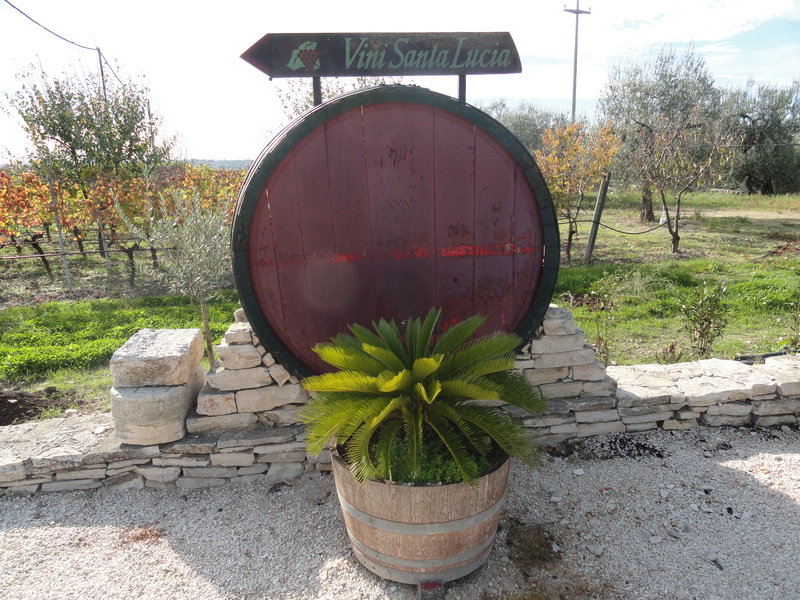 Food and wine tours in Puglia and the surrounding area by Vincenzo Rizza and Nicholas Bell. Radici wines: Guide on Apulian wines for experts and wine lovers 2011 (second edition). Based on an idea by Nicola Campanile, who is also the editor. Texts by Franco Zilliani (wine professional) and Vincenzo Rizzi (wine lover) English Texts by Kyle Phillips. The wines in this book were chosen by two panels one made up of wine professionals called, The technical jury and one made up on non-professionals called The wine lovers jury. The book contains reviews of 178 wines competing for the top awards that were given out the last day of the Radici Experience. All the wines in the competition are from the indigenous grapes of Puglia. There is an interesting article by Nicola Campanile president of ProPapilla titled “Southern Roots and good reason to think big”. If you sign up on the site you can find the 35 wines that took top honors as well as the other awards that were given out. Valerie’s New York www.wor710 listen to Charles Scicolone On Wine every Wednesday at 6:05.
www.loveofpizzatour.com – pizza and more! Dear Charles, thanks for nice words and remembering our first meeting in the restaurant so many years ago, was the first time i have see my wines on a NYC wine list and i will never forget. Hoping to see you soon again. I’m a huge fan of Azienda Monaci’s “Sine Pari,” made with 100% Nero di Troia. Exceptionally smooth. It’s a great grape.